Karl Tatler has it in the bag! 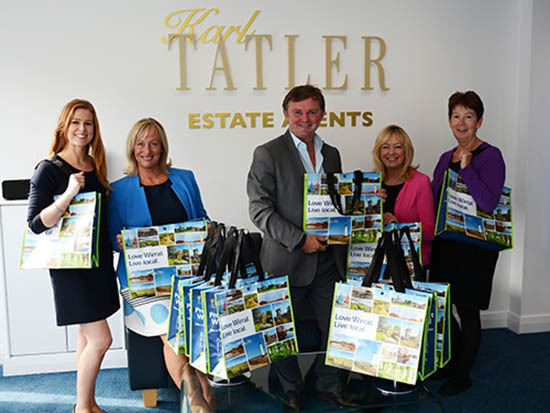 Karl Tatler Estate Agents & Lettings are launching their own bag for life in a bid to help people protect the local environment by reducing their use of plastic bags. With 8.5 billion free plastic bags used by British supermarket shoppers in 2014*, the law change on the 5th October means retailers will have to charge at least 5p per plastic bag. Available in all of Karl Tatler’s seven branches across Wirral from Saturday (3rd), the 100% recyclable, 100% reusable bags feature stunning photography of Wirral landmarks and landscapes. To celebrate the launch of the bags, Karl Tatler is running a competition on their Facebook and Twitter pages to win a luxury hamper from local food hall Whitmore & White. The competition starts today (Friday 2nd October) and runs until 8th October. The Karl Tatler bags for life were manufactured by a family run business with over 10 years’ experience and high levels of ethical and quality standards. The new law effects retailers employing 250 or more staff, with exceptions for certain goods purchased. Retailers who fit the criteria and fail to charge for bags appropriately could be fined up to £5,000. The charge in England follows the success of similar schemes in Scotland, Wales and Northern Ireland. In Wales the charge led to a 79% decrease in plastic bags within three years and in Scotland the number of bags for life used quadrupled**.